Colorizing black-and-white pictures has been a photographic technique ever since the invention of film. Of course, back then, each colored element was hand-painted onto the b&w print. Even with the digital revolution, most colorizing is done with painstaking and precise stylus painting, using programs such as Adobe Photoshop or Corel Painter. Akvis Coloriage ($97 for Home version; 10-day free trial) is an automated colorizing tool that you can use to create some great effects by simply squiggling lines and curves. Akvis Coloriage automates the process of colorizing photos, and provides a nice selection of natural gradients, for coloring objects such as lips, eyes, skin, woodwork, fabric, etc. Coloriage's interface is clean and comparatively easy to use, once you understand the basics of the program. (The trial download includes the option of a PDF manual that is very helpful in getting you started.) The workspace is tabbed between the Before and After views of your picture. Unfortunately, it doesn't have a side-by-side option. All you do is use the Pencil tool and the color palette to define areas that you want colored. Click on the Process button, and voila!, you have a colorized photo. The Color Library is divided into types of color, such as for skin, eyes, wood, fabric and such, or you can choose your own colors from the palette. The Deluxe and Business editions have also added a new Multicolor pencil. 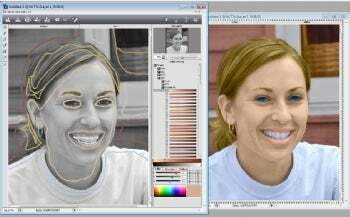 Coloriage will work with color photos as well as black and white, allowing you to change the colors of specific objects, while defining areas where you want to keep the original colors, using the Keep-color Pencil. In addition, Coloriage can be used to color drawings and even individual animation frames. Your strokes can be saved, which is useful when you have a series of similar photos. Various tools (beyond the eraser) allow you to change your mind. For instance, the Tube redefines the color of a stroke, the Magic Tube recolors all strokes of the same color, and the Recolor Brush applies transparent hues to the After image. So, you can flip between the Before and After windows, editing your strokes, until you're satisfied with the results. Coloriage opens and saves TIFF, BMP, JPEG, and PNG files. The plug-in is now compatible with both 32-bit and 64-bit Adobe Photoshop, as well as Adobe Photoshop Elements 8. Unfortunately, in the standalone version, you can't access files on a network; it works only on photos available to the local computer. Akvis Coloriage does a nice job of automating colorizing. Although it takes some back and forth editing to perfect your work, it is an easy program to master and the results can be quite appealing. Note: The price given here is for the Home plug-in or Home standalone version. The Home Deluxe ($121) and the Business ($246) licenses provide both the standalone and the plug-in. Each time you start up the Trial version, it gives you the option of testing the Home standalone, Deluxe, or Business editions.